Xiaomi is reportedly setting up to launch its first 5G-compliant smartphone, based on the Mi MIX 3, on February 24th. Word pertaining to the launch was shared on Twitter by user Ben Geskin, who is known to have tipped quite a few product launches in the past. However, the tweet has since been deleted, although the infographic that was shared has now been reuploaded online. To affirm, there is literally nothing in the invite that seems to suggest that the Mi MIX 3 5G will be launched on February 24th. It only reads ‘we make it happen’, along with Xiaomi’s company logo. While this indeed points at an impending launch from Xiaomi’s stable, it can also allude to other devices as well — for instance, the flagship Mi 9. That said, there is a fair amount of chance that the Mi MIX 3 5G will be launched at the Mobile World Congress, Barcelona, which begins from February 25th. A working prototype of the Mi MIX 3 5G was unveiled and demonstrated at the China Mobile Partner Conference in Beijing, in late 2018. The demonstration showed the Mi MIX 3 being aided by Qualcomm’s X50 modem that doubles the already-possible gigabit class internet bandwidths on mobile devices. For reference, the Snapdragon X50 modem is an optional pairing that OEMs can opt for, when they equip their smartphones with the Qualcomm Snapdragon 855 SoC. That said, it remains to be seen how Xiaomi upgrades the existing Mi MIX 3 smartphone to 5G network capabilities. For once, the Mi MIX 3 is expected to largely retain the same internals as the already existent, 4G-complaint phone. 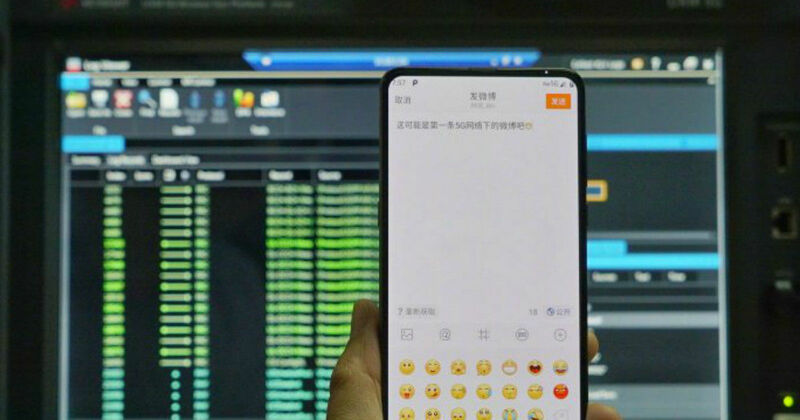 Xiaomi may simply upgrade it to the Snapdragon 855 platform, keeping most other internals same. Integrating antennae would be another factor — the Mi MIX lineup is all about aesthetics, and integrating antennae for mmWave 5G spectrum may mean disrupting the fluid aesthetics of the devices.